Billionaire globalist George Soros’ Open Society Foundations, a group that funds dozens of non-governmental organizations in Hungary, may move its staff out of Budapest amid a crackdown on civil society by Prime Minister Viktor Orban. OSF is “considering various options” and is “closely watching developments around draft legislation that would dramatically restrict the activities of civil society in Hungary,” the charity said in an emailed statement on Friday. The foundation will move about 100 employees out of Hungary. Speaking on public radio, Viktor Orban said he wouldn’t shed “crocodile tears” if the organisation left Budapest. The European Union has sued Hungary over its perceived crackdown on civil society as Orban leads a trend of leaders in Europe who have targeted Soros-funded organizations. 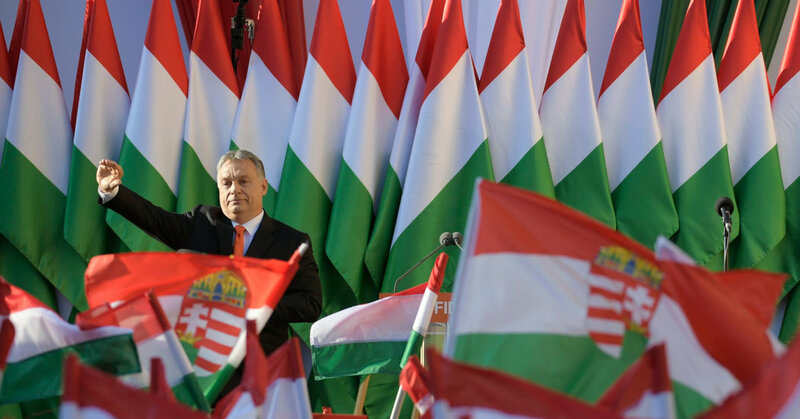 Orban, re-elected to a third consecutive term this month, demonized the Hungarian-born Holocaust survivor and pledged to punish NGOs he supports. Orban has condemned the EU’s multicultural democratic model, based on checks and balances and a thriving civil society, and has worked to create an “illiberal state” modeled on Russia and Turkey. OSF established its first office abroad in Budapest in 1984 to support the democratization of the then communist country. Active globally, the charity is the main conduit for aid to more than 60 Hungarian NGOs and has spent more than $1.6 billion on democratic development in eastern Europe and the former Soviet Union in the past 30 years. In its statement, the foundation said it would remain committed to continuing work in Hungary, but was looking at options to maintain the integrity of its work and the security of its staff in Budapest. Orban, who received a Soros-funded scholarship in 1989, has pledged to pass a bill his government submitted to parliament before the election to tax funds that NGOs receive from abroad and to penalize people who are deemed as supporting “illegal” immigration. Central European University, another institution established by Soros in Budapest and targeted by the premier, has announced plans for a satellite campus outside of Hungary, as it considers whether it can continue to operate in Hungary. Viktor Orban celebrates his 2018 election victory. Thanks for the marvelous posting! I truly enjoyed reading it, you are a great author.I will be sure to bookmark your blog and definitely will come back sometime soon. I want to encourage you to continue your great work, have a nice afternoon! Hiya, I’m really glad I’ve found this information. Nowadays bloggers publish only about gossips and internet and this is actually annoying. A good website with exciting content, this is what I need. Thank you for keeping this web site, I will be visiting it. Do you do newsletters? Can’t find it. We’re a gaggle of volunteers and starting a brand new scheme in our community. Your website offered us with useful info to work on. You have performed a formidable activity and our entire neighborhood shall be thankful to you. I do not even know the way I stopped up here, but I thought this put up was once good. I don’t understand who you are however definitely you’re going to a famous blogger if you happen to are not already 😉 Cheers! I genuinely enjoy looking at on this web site, it contains fantastic content. “Words are, of course, the most powerful drug used by mankind.” by Rudyard Kipling. I truly wanted to make a brief message in order to express gratitude to you for the fabulous concepts you are giving on this site. My considerable internet search has now been compensated with pleasant facts and strategies to share with my good friends. I ‘d believe that many of us site visitors actually are rather endowed to live in a notable website with so many outstanding individuals with helpful pointers. I feel truly happy to have encountered your entire website page and look forward to many more brilliant minutes reading here. Thank you once more for all the details. Good – I should certainly pronounce, impressed with your website. I had no trouble navigating through all the tabs as well as related information ended up being truly easy to do to access. I recently found what I hoped for before you know it in the least. Reasonably unusual. Is likely to appreciate it for those who add forums or something, web site theme . a tones way for your client to communicate. Nice task..
Its excellent as your other articles : D, regards for putting up. “Even Albert Einstein reportedly needed help on his 1040 form.” by Ronald Reagan. As I website owner I believe the content material here is really fantastic, appreciate it for your efforts. Wow, incredible weblog layout! How long have you ever been blogging for? you made running a blog glance easy. The total look of your site is magnificent, let alone the content material! wonderful points altogether, you simply won a new reader. What could you suggest in regards to your post that you simply made a few days ago? Any certain? I am not real good with English but I find this real leisurely to read . I will immediately seize your rss feed as I can not to find your email subscription link or e-newsletter service. Do you have any? Please permit me recognise in order that I may subscribe. Thanks. I have learn some good stuff here. Definitely worth bookmarking for revisiting. I wonder how so much effort you place to make this type of excellent informative website. you are actually a just right webmaster. The web site loading pace is incredible. It kind of feels that you are doing any unique trick. Moreover, The contents are masterpiece. you’ve done a wonderful job in this matter! Hello, i believe that i saw you visited my web site so i came to “return the want”.I’m attempting to to find things to improve my website!I assume its adequate to make use of some of your ideas!! Hi there! I just would like to give an enormous thumbs up for the good info you’ve here on this post. I will probably be coming again to your weblog for more soon. My wife and i have been very ecstatic Ervin could complete his basic research with the ideas he had using your site. It is now and again perplexing just to be giving out guidelines the rest have been selling. And we also know we have the writer to be grateful to for this. The entire illustrations you’ve made, the straightforward blog navigation, the friendships you can assist to instill – it’s mostly amazing, and it is assisting our son in addition to our family reason why the idea is fun, which is quite mandatory. Thanks for all! I loved as much as you’ll receive carried out right here. The cartoon is tasteful, your authored material stylish. however, you command get got an shakiness over that you want be delivering the following. sick indubitably come further in the past again since exactly the similar nearly a lot often within case you shield this hike. There are actually loads of particulars like that to take into consideration. That could be a nice point to bring up. I provide the ideas above as common inspiration but clearly there are questions just like the one you deliver up where the most important thing will probably be working in trustworthy good faith. I don?t know if greatest practices have emerged around things like that, but I’m positive that your job is clearly recognized as a fair game. Each girls and boys really feel the impact of just a second’s pleasure, for the remainder of their lives. Great ?V I should certainly pronounce, impressed with your site. I had no trouble navigating through all the tabs and related info ended up being truly easy to do to access. I recently found what I hoped for before you know it in the least. Reasonably unusual. Is likely to appreciate it for those who add forums or anything, website theme . a tones way for your client to communicate. Excellent task.. Thank you for another wonderful article. Where else may just anybody get that kind of information in such a perfect means of writing? I have a presentation subsequent week, and I’m on the look for such information. Hello there, I found your website via Google at the same time as looking for a comparable matter, your web site came up, it looks good. I’ve bookmarked it in my google bookmarks. I’ve been surfing on-line greater than 3 hours nowadays, yet I by no means found any interesting article like yours. It?¦s pretty worth enough for me. In my opinion, if all webmasters and bloggers made excellent content material as you did, the net will be a lot more useful than ever before. I’m impressed, I must say. Really not often do I encounter a weblog that’s both educative and entertaining, and let me inform you, you may have hit the nail on the head. Your concept is outstanding; the problem is something that not sufficient people are speaking intelligently about. I’m very completely satisfied that I stumbled across this in my search for one thing relating to this. Hi there very nice site!! Man .. Excellent .. Wonderful .. I’ll bookmark your blog and take the feeds alsoKI am happy to seek out numerous useful information right here within the submit, we need develop more techniques in this regard, thanks for sharing. . . . . .
Hmm it seems like your blog ate my first comment (it was super long) so I guess I’ll just sum it up what I submitted and say, I’m thoroughly enjoying your blog. I as well am an aspiring blog writer but I’m still new to everything. Do you have any points for rookie blog writers? I’d definitely appreciate it. You actually make it appear so easy along with your presentation however I in finding this topic to be really one thing which I think I would never understand. It sort of feels too complex and very wide for me. I’m taking a look ahead in your next post, I will attempt to get the cling of it! Hey I am so delighted I found your webpage, I really found you by error, while I was browsing on Yahoo for something else, Nonetheless I am here now and would just like to say thanks for a remarkable post and a all round entertaining blog (I also love the theme/design), I don’t have time to look over it all at the minute but I have saved it and also included your RSS feeds, so when I have time I will be back to read a lot more, Please do keep up the superb job. I’m just commenting to let you know what a really good encounter my friend’s child obtained checking the blog. She picked up a lot of issues, not to mention how it is like to have a very effective giving nature to have most people without hassle learn specific very confusing matters. You truly surpassed readers’ expected results. Thanks for showing those powerful, trusted, edifying and even easy guidance on the topic to Kate. wonderful publish, very informative. I’m wondering why the other experts of this sector don’t realize this. You should proceed your writing. I’m confident, you have a huge readers’ base already! Have you ever thought about including a little bit more than just your articles? I mean, what you say is fundamental and all. Nevertheless just imagine if you added some great pictures or videos to give your posts more, “pop”! Your content is excellent but with images and clips, this site could definitely be one of the very best in its field. Excellent blog! Some genuinely superb info , Gladiola I detected this. “Someone’s boring me. I think it’s me.” by Dylan Thomas. magnificent points altogether, you just won a new reader. What would you suggest in regards to your put up that you just made some days in the past? Any positive? Have you ever thought about adding a little bit more than just your articles? I mean, what you say is important and all. But just imagine if you added some great visuals or videos to give your posts more, “pop”! Your content is excellent but with pics and videos, this site could definitely be one of the very best in its niche. Fantastic blog! Greetings from Florida! I’m bored at work so I decided to browse your website on my iphone during lunch break. I enjoy the information you present here and can’t wait to take a look when I get home. I’m surprised at how quick your blog loaded on my phone .. I’m not even using WIFI, just 3G .. Anyways, excellent blog! Excellent post. I was checking constantly this weblog and I’m inspired! Extremely helpful info specifically the ultimate section 🙂 I care for such information much. I was seeking this certain information for a very lengthy time. Thank you and good luck. It’s in reality a nice and helpful piece of information. I’m satisfied that you just shared this useful info with us. Please keep us informed like this. Thanks for sharing.